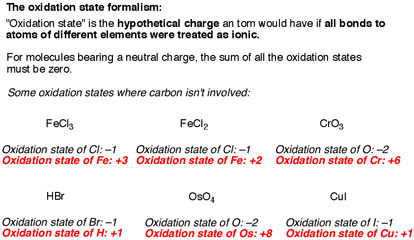 By the end of gen chemistry, calculating oxidation states of different metals should be pretty familiar. Here’s what you do. Take a typical compound – \(FeCl_3\), for instance. Treat every bond between the metal and a different atom as if it were an ionic bond. That means the more electronegative elements (like chlorine, say, or oxygen) bear negative charges, and the less electronegative element (such as the metal) bears the positive charge. (Don’t forget that this is called a “formalism” for a reason. The charge on the carbon is not really +4 or –4. But the oxidation state formalism helps us keep track of where the electrons are going, which will come in handy very soon).